PHOTO BY JIMMY FLINT Seneca Industrial and Economic Development Corp. President and CEO David Zak speaks during the SIEDC annual dinner and meeting at Camden Falls Reception and Conference Center Thursday night. 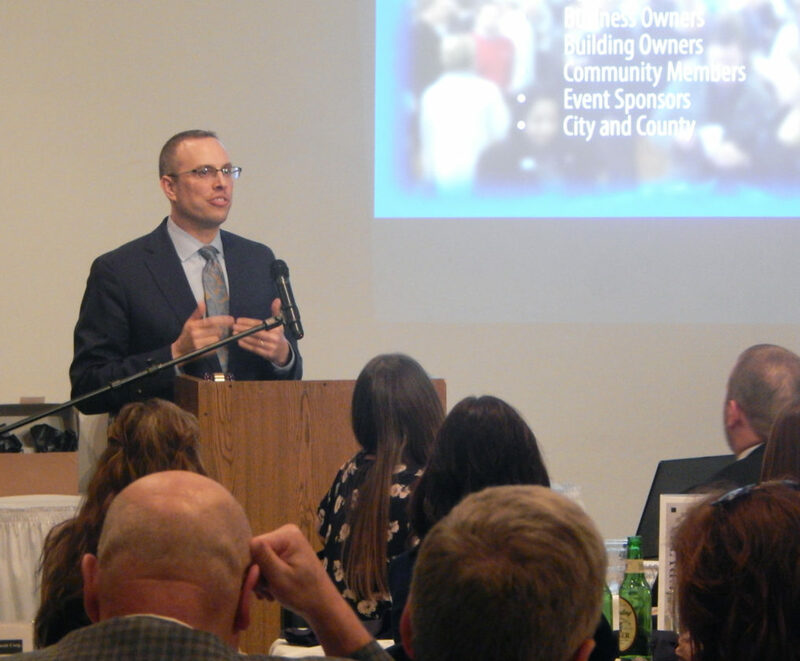 Several area business leaders were recognized during the Seneca Industrial and Economic Development Corp. annual dinner and meeting Thursday night. SIEDC President and CEO David Zak announced a deal that will offer discounts on courses at Heidelberg and Tiffin universities to workers at member organizations of SIEDC and Seneca Regional Chamber of Commerce and Visitor Services. He called the agreement “innovative and historic” and said it is a way to support businesses and their employees by saving qualifying employees up to $200 per credit hour. “I couldn’t be more thrilled,” he said. He recounted how Heidelberg University came to Tiffin. The school, founded in 1850 by members of the German Reformed Church, was created partly because of financial incentives offered by the city. He said Tiffin offered incentives worth about $300,000 in today’s money. Zak said Heidelberg — started with two faculty members and five students — has grown to more than 1,300 students. He also said Tiffin University was formed as a subset of Heidelberg before becoming independent. He said growth of the universities and growth of the community are a product of embracing each other and embracing diversity. He said TU has about 400 international students and Heidelberg was one of the first universities in Ohio to admit women and African-American students. Zak also said a 50,000-square-foot spec building valued at more than $1 million is to be built, either between Toledo Mold and Die and Tiffin Insulators or in a planned new industrial park. In closing, he cited a 75-year study by Robert Waldinger about happiness. He said one finding was that people need relationships to be happy. “Relationships not only with your family and friends, but with your community,” he said. Zak said Seneca County will see more success if people continue to build a relationship with their community. Another speaker, SIEDC Communications Coordinator Katie Lang, said 2016 was a good year for the communications department of SIEDC. Last year, the organization posted 123 articles, which had 114,000 views, she said. Lang also announced a new monthly SIEDC publication called Seneca Works. It will follow the progress of the Workforce Development Plan, which aims to attract and retain a vibrant workforce in Seneca County while unleashing its potential to grow. Development Coordinator Bryce Riggs said 2016 was an exciting year for economic development in the county. He said it included expansion projects and new businesses coming to town. Downtown Main Street Manager Amy Reinhart said downtown Tiffin received National Main Street Accreditation, to go along with its state accreditation. “This puts our downtown at the same level as the top national downtowns,” she said. Reinhart said the accreditation will be celebrated during the annual downtown summit May 18. She also said 11 new businesses opened in downtown Tiffin in 2016. Tiffin Mayor Aaron Montz was given The President’s Award. * Partnership in Development Award — Regional Growth Partnership. * Economic Development Award — Church & Dwight. * Entrepreneurial Spirit Award — Roger Benz and Concordance Healthcare Solutions. * Outstanding Business Award — TPC Food Services. * Lifetime Achievement Award — Old Fort Banking Co..